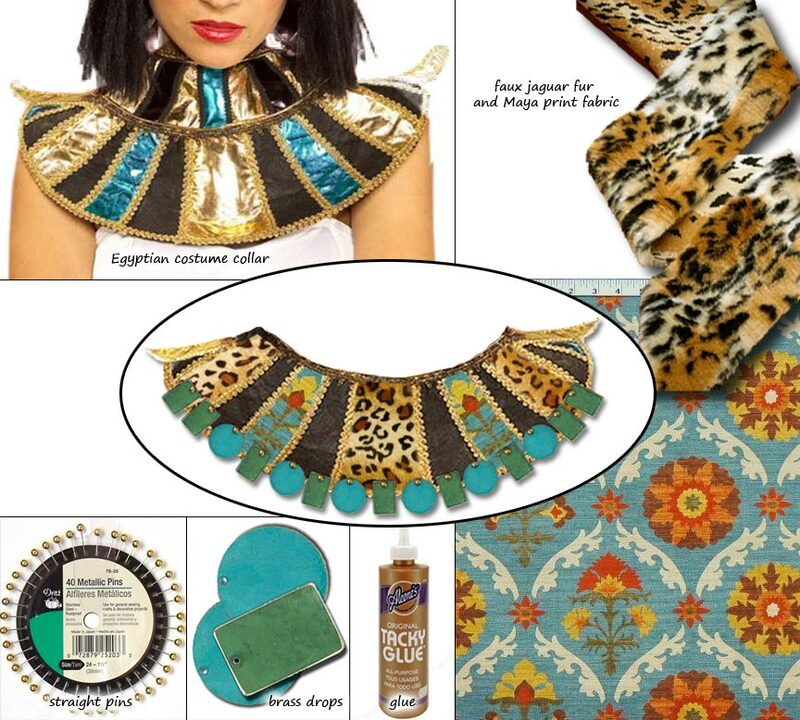 Ixchel | Take Back Halloween! Why yes, that is a snake on her head. Ixchel is the Maya goddess of fertility, childbirth, weaving, and maybe the moon. The snake in her hair is the cosmic serpent, representing rain and the creative principle, while Ixchel herself is shown pouring out the waters of heaven from an upturned jar. She wears a blue sarong wrapped around her waist (sometimes patterned with stars, sometimes with crossbones), a bandeau blouse, and a necklace of big jade beads. She’s also a jaguar goddess, and sometimes sports jaguar claws and pelt. Occasionally she’s even depicted as a death-dealing warrior, which is a neat complement to her more familiar role as midwife. Ixchel’s got both ends of the life cycle covered. 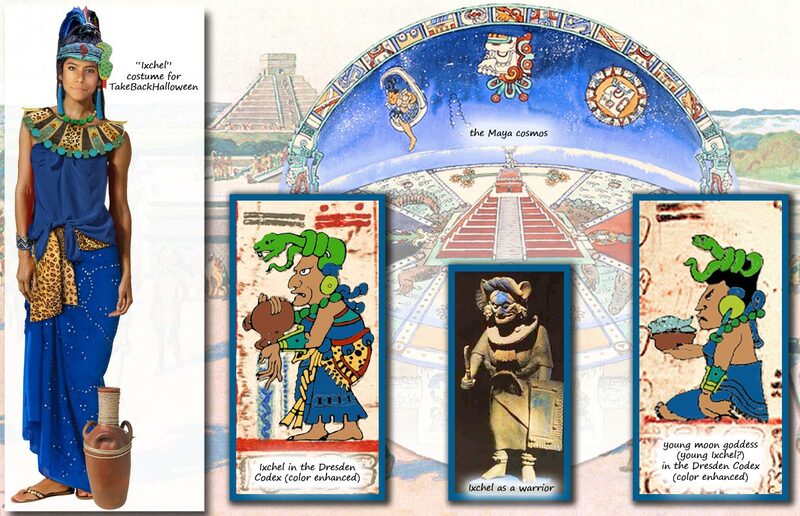 Nowadays Ixchel is popularly assumed to be a moon goddess, but it’s not clear if that’s how the ancient Maya saw her. It’s quite possible that the modern association with the moon is the result of a 20th century mix-up; see Mending the past: Ix Chel and the invention of a modern pop goddess. There are images in the Mayan codices of a young moon goddess sitting in the lunar crescent, holding a rabbit. Is this a youthful version of Ixchel, or a completely different figure? We don’t know, but it’s interesting that this young goddess also wears a snaky headdress. 1. Sequined embroidered sarong in blue. This is for your skirt. The color is wonderfully vivid—reminiscent of the famous “Maya Blue” paint that coated figurines of Ixchel—and the sequins evoke the stars that were sometimes embroidered on her skirt. 2. Blue half-sarong. Use this as your top; just tie it around you bandeau style. 3. 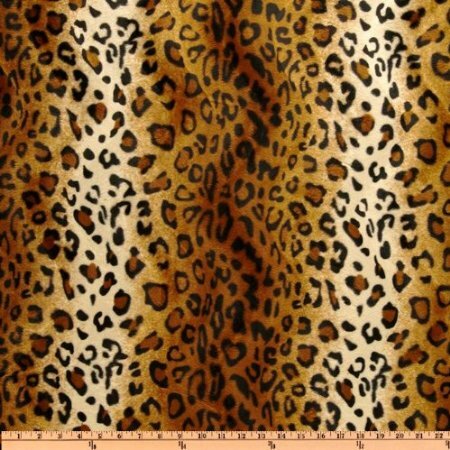 One yard of faux jaguar fur fabric . Okay, really it’s faux leopard fur, but close enough. This fabric is 62 inches wide, so if you buy one yard you’ll have a big 36 x 62 inch rectangle. That should be enough to wrap around your hips as a sash, minus a few scraps you’ll need to snip off to use on your collar (#6). 4. Jewelry. Ixchel wears a distinctive necklace of big green jade beads. Assuming you don’t have any priceless jade jewelry on hand, this green bead necklace is a good substitute. Instead of giant ear spools, we chose blue tassel earrings —reminiscent of sheets of rain cascading down. Complete your look with a cuff bracelet . 5. Headdress. This is just a couple of fair trade Guatemalan cotton scarves tied around your head (Ixchel is also the goddess of weaving! ), with a cute plush snake toy tucked inside. We chose scarves in purplish blue and light greenish blue. You can get a plush snake online, or just go to the grocery store and look in the pet aisle for dog toys. 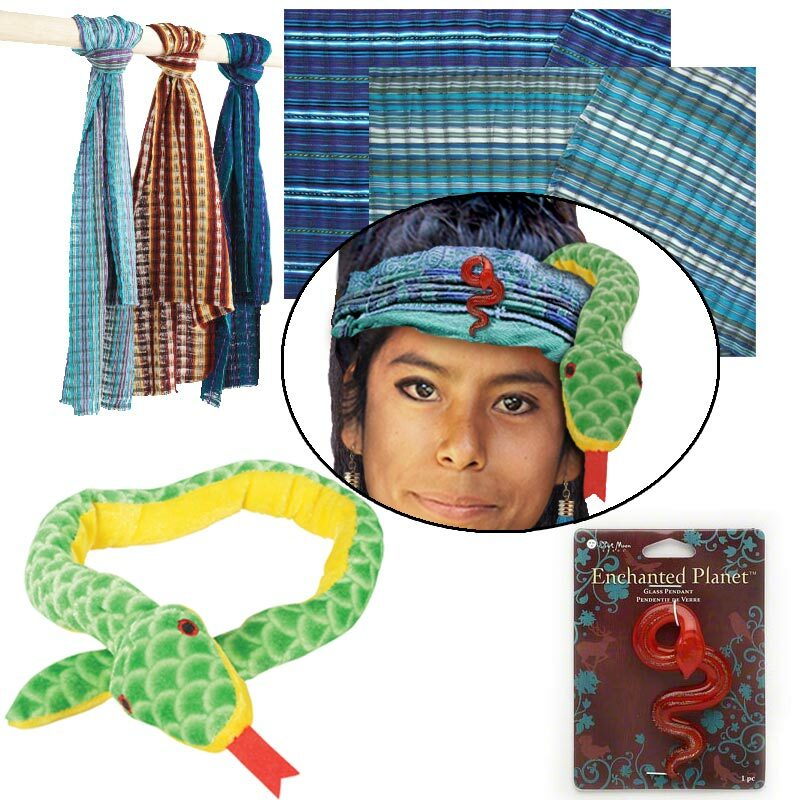 Arrange it so that the head of the snake kind of pokes out over the top of the scarves. Accentuate the ensemble with this glass red snake from Firemountain Gems; just tie it on to the front of your headdress with thread. Hair: If at all possible, pull your hair up into a big ponytail right on top of your head. A topknot would also work. You want to create a vertical line, since the Maya concept of beauty involved having a head that looked as much like an ear of corn as possible. You can accentuate your ponytail/topknot with some colored feathers . What to carry: Ix Chel is shown pouring out the waters of life from her magical jar, so you could carry an earthenware-looking pot with you, perhaps filled with Halloween candy. The jar we show in our illustration is a real terra cotta vase from Mexico, which is gorgeous but probably much too heavy to actually haul around with you on Halloween. (It would look great in your house though.) We suggest you go to the local home & garden center and look for a lightweight resin pot that’s molded to look like earthenware. Illustration credits: The drawing of Ixchel pouring water from her jar is on page 39 of the Dresden Codex. The drawing of the young goddess (young Ixchel?) offering a plate of fish is on page 23 of the Dresden Codex. The warrior goddess figurine is from Jaina Island, and is identifed in The Gods and Symbols of Ancient Mexico and the Maya by Mary Miller and Karl Taube. The round painting of the Maya cosmos is An illustration of the Maya universe on a tiered pyramid by Ken Dallison for National Geographic; notice that the young moon goddess is sitting in the lunar crescent in the upper left portion of the sky. The background image is an old painting of life in Chichen Itza, artist unknown.